The Guide to Sustainia was a visionary publication depicting what a truly sustainable future society could look like. Historically, environmentalists have relied on narratives of fear and catastrophe to engage people on issues such as climate change and sustainability, but studies have shown that often this approach can have the opposite effect, numbing people to the consequences of these problems and making people ignore the difficult questions. There was a large challenge in how to effectively engage people with these serious issues, in order to spur much-needed action. Sustainia is a new and needed approach to communicating about sustainability. Sustainia developed a pioneering approach to communicating about sustainability and climate change, and with the Guide to Sustainia, we used positive narratives and storytelling techniques to show what a future society could look like. 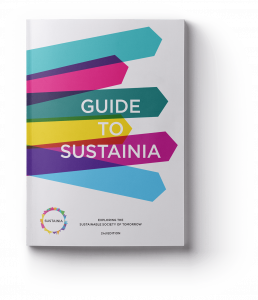 Despite the age of the publication, the Guide to Sustainia is still a benchmark for communicating sustainability in an engaging and inspiring manner. The guide is available for download here. Sustainia is my kind of world: A desirable place where we live life to the fullest, without damaging the only planet we have. We worked with a consortium of organisations on this publication: Realdania, DNV-GL, Ørsted (formally Dong Energy), and Novo Nordisk.